Houbigant Iris des Champs was released in fall 2014; it is the brand's first launch since Orangers en Fleurs, a fragrance that I happened to enjoy quite a bit. 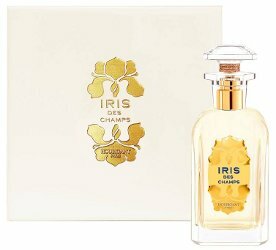 Iris des Champs is described as "a heady, plush homage to iris," with notes of bergamot, pink pepper, rose, lily of the valley, pear, iris, jasmine, ylang-ylang, sandalwood, amber, woody notes, vanilla and musk. It was developed for Houbigant by perfumer Mathieu Nardin. I looked forward to trying this fragrance, especially since I like many iris fragrances — and how beautiful is that packaging, right? Unfortunately, Iris des Champs didn't quite live up to my expectations. I've been sampling the Extrait de Parfum version this week. It begins in a promising fashion, with a rooty-green iris accord. Weirdly, that iris only lasts about a half-hour, to be replaced by a lighter heart of soapy orange blossom and other clean white florals with a background of transparent woods. By this point, it would be impossible to describe Iris des Champs as "heady" or "plush." In fact, it reminds me a bit of Prada Infusion d'Iris or Infusion d'Iris Absolue — it probably falls midway between the two in terms of intensity. That is, it's more of a sheer, contemporary interpretation of iris than an "homage" to classic iris fragrances. Its dry down is quiet but clings to my skin for hours. Too bad it's still not identifiably "iris," but more of a vanilla-musk skin scent with a dash of pink pepper. Now that I'm reading some other reviews (which I try to avoid until I've finished drafting my own), I'm finding that some other bloggers got more out of this fragrance than I did. (Maybe the Eau de Parfum is somehow richer?) To my nose, Iris des Champs is nice enough, but it's not going to replace Le Labo Iris 39 or the dearly departed L'Artisan Parfumeur Orchidée Blanche as my favorite iris fragrance. It's also very expensive, and this kind of pricing really bothers me when the fragrance in question really isn't all that distinctive. If I were to purchase another iris perfume, I'd choose Au Pays de la Fleur d'Oranger Rose Irisée, which gives far more bang for the buck (even if its bottle isn't as pretty). Are you an iris-lover? 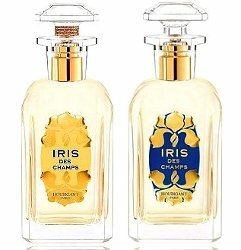 Have you tried Iris des Champs? Can you recommend any other new iris-themed fragrance? Feel free to comment. Houbigant Iris des Champs is available as 100 ml Extrait de Parfum ($600; shown top left and just above) and 100 ml Eau de Parfum ($190; shown top right). For purchasing information, see the listing for Houbigant under Perfume Houses. Oh, I love those bottles, and am sad to read that they contain another nondescript juice, and after seeing the price, more than a little relieved! Now I need to put LeLabo 39 and Rose Irisee on my samples to acquire list. I love your pull no punches reviews…just say it the way you smell it! Meredifay, I love Iris, I love the Houbigant heritage… I wanted to love this fragrance! Yes I don’t like have my anticipation defeated by a disappointing reality…Lol! Those bottles are gorgeous and is a shame that you’re not loving the perfume. I actually really like the Au Pays de la Fleur d’Oranger bottles too though, so maybe I should just try that one. :). Thanks for the review! Yes… I wish I loved this one more, even though the parfum is prohibitively expensive! Too bad this didn’t live up to the beautiful bottle. I really need to check out the Au Pays line. I like Grand Neroli by Atelier Cologne and I’m curious how their Neroli fragrances compare. Rose Irisée sounds really nice too. I wonder if they still sell these at Anthropologie. On another note, it looks like Lush has released their limited editions for Valentines day. They have a shower gel called Prince Charming. Have you tried this one before? They also have a new rose jam massage bar called pearl but I don’t think it’s limited edition. Jonas, I need to make a visit to Lush later today or tomorrow! I saw that Pearl massage bar in the catalogue but haven’t tried it yet, and I didn’t know about Prince Charming until now. I shamelessly asked for a sample and the SA claimed not to have any sample atomizers. It was indeed the case, but rather than allowing me to use one of my own sample atomizers, she partially filled a GWP atomizer! I have not yet tried it on skin but it seemed nice on paper. The ways of SAs and their responses to sample requests will ever be mysteries to me!! At least you did walk away with something! I tried it at Neiman Marcus a little while ago and had exactly your experience. I believe I tried the EDP though. Connie, I’m glad I’ m not alone. I tried it three or four times, and I just couldn’t get any more depth out of it! Ditto from me. I had high expectations since I love the orange, but this was definitely disappointing, it was absolutely wan. So far the best iris I’ve found have been Malle’s Iris Poudre and Aedes Iris Nazarena. Both most definitely fbw. Why do I have such expensive taste? I did try it and so wanted to love it, but it fell so short. Saving for a bottle of Scent of Hope instead. (Most of the irises I tried this year, while Discovering Iris, disappointed. Xerjoff’s Irisss is nice but not wow enough for the price. Fougere Royale” Touted as the First Fougere” it could not be anything further from the truth. (The Company reps. even went as far as saying that because of modern regulations they could not make a perfume to close the original) I know what the regulations are and this statement is false) I own many bottles of F.R. from many different decades. even two different bottling’s of the parfum from the 1920’s. The new version is so thick and dull and this is a fragrance that wears me and not the other way. The vintage Fougere Royale variations most wonderful. Houbigant is one of the most important of all the Grand Classic Perfume Houses. Very Rarely do they make such poor choices with there new perfumes. However, I hope this this will not be signs of things to come.